An action-packed mystery western based on the best-selling novel by Alistair MacLean (The Guns of Navarone, Ice Station Zebra, Where Eagles Dare), Breakheart Pass throws open the throttle for runaway excitement! At the height of the frontier era, a locomotive races through the Rocky Mountains on a classified mission to a remote Army post. But one by one, the passengers are being murdered. Their only hope is John Deakin (Charles Bronson, Hard Times, The Magnificent Seven), a mysterious prisoner-in-transit who must fight for his life – and the lives of everyone on the train – as he uncovers a deadly secret that explodes in a torrent of shocking revelations, explosive brawls and blazing gun battles. 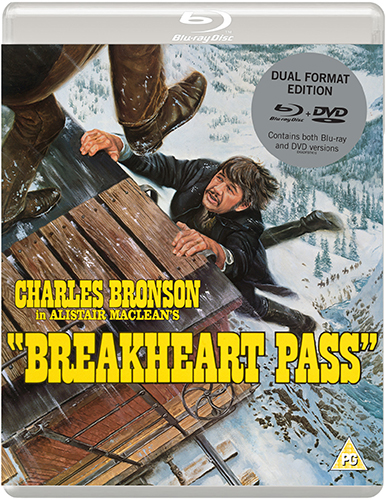 With a rousing score by Jerry Goldsmith and a powerful supporting cast that includes Ben Johnson (The Last Picture Show), Richard Crenna (First Blood) and Jill Ireland (Hard Times), Eureka Classics is proud to present Breakheart Pass for the first time on Blu-ray in the UK in a special Dual Format edition.